I've finally finished exams for the year! I'm hoping that means this will also be the last Untappd Catchup for the year, although December can be a busy time... Today I've got 23 beers for you across 27 badges! As usual let me know your thoughts on any that you've had the pleasure (or displeasure) of trying before. First up was Mikkeller Spontandryhop Citra, which unlocked Danish Delight (Level 8). This was a beautiful beer, with pleasant sourness mixing with plenty of juicy Citra hops. It finished beautifully dry and I know I will be getting plenty more of these over summer! I can't remember how long it's been since a beer unlocked 3 badges in one check-in for me! Tiny Rebel's Cwtch (one of the most Welsh words I can think of!) did just that, with God Save the Queen (Level 37), Paint the Town Red (Level 11) and Riding Steady (Level 8) all unlocked. This was a really nicely balanced Red Ale with malt and hops combining perfectly. Cavalier's Imperial Stout is one of those beers that I try and imbibe at least once a yeah. This was one of the first Russian Imperial Stouts that I really enjoyed; and this time it unlocked 2X (Level 8) - the badge for drinking "Imperial" styles of beer. It's a lovely chocolaty RIS, with roast coffee, dark fruits and some licorice also present. I feel this beer gets bypassed for some of the better known Australian examples/internationals, but it's definitely one worth trying. As has become tradition; I headed to Dr Morse before my last MBA exam of the year. That day happened to be the day that Untappd released their new range of core badges including, Cheers to You! (Level 3), a badge celebrating the day you joined Untappd - which will be unlocked the first day you check in a beer after your personal Untappd Anniversary. In any case; a pint of Hop Nation's The Chop was the beer that unlocked this somewhat convoluted badge. It's an IPA packed full of tropical fruit notes and is a must try for all IPA lovers! In preparation for my trip up to Beechworth I decided it was finally time to crack my Bridge Road Mayday Hills: Yee-Hah!. A Brettanomyces Pale Ale; it's the first beer to come out of their new Foeder. I've heard varying reviews of this beer; however I thought it was lovely fruity Pale Ale with nice Brett characteristics. I enjoyed it so much I picked up a 4-pack at the brewery to try over various time frames. Pucker Up (Level 45) is why you're hearing about it. Up in Beechworth I assumed a Bridge Road Brewers beer would be the first to unlock a badge... Then we made a stop in at Beechworth Honey Discovery and sampled their paddle of Meads. Their Classic Mead unlocked Hey Honey, funnily enough the badge for drinking different Meads. The tasting notes said it would be dry, and it certainly was. The honey was far less pronounced than in most other Meads I've had and it was dangerously drinkable for the 9.5% ABV. Somehow Bridge Road escaped without a badge being unlocked. but back home along came Riding Steady (Level 9). The beer was Dainton's new Blood Orange Berliner Weisse. I quite liked this beer but thought it could've had a bit more of everything. The orange flavour was a little weak, as was the tartness. It was however particularly refreshing and a nice Australian example of a Berliner Weissbier. The Better Together badge has dried up a little in recent months. (Level 16) was unlocked by Saison du Buff, a collaboration between American powerhouses Stone, Dogfish Head and Victory. It had a nice amount of Belgian funk. Where it was different from others Saisons I've had recently was this strong herbaceous qualities, with sage the only one I could identify positively. I'd be keen on trying this one again in the future. Keep Your Wits About You is a badge that doesn't come around all that often for me; Estrella Inedit unlocked (Level 6). It was the first time I'd sampled this beer in a number of year. By itself it's a relatively straight up and down Witbier with orange peel, coriander and pepper all present. When you pair this beer with food it changes completely; gaining this malt sweetness and drawing out some extra fruitiness. It comes in a 750ml wine bottle and I'd recommend trying half of it before eating and then the other half whilst eating - it's a very strange experience, you'd think you're drinking two different beers. Epic's new IPA Gods of War was my first of many beers last Friday. Consequently it unlocked Beer-giving (2016), a badge commemorating the most American of holidays - Thanksgiving. Epic very rarely disappoint and this IPA was no exception. It was packed full of passionfruit with a nice resinous pine backing. This is from their new IPA Hysteria range, something there is little information about at this stage - but that I'm certainly looking forward to! On Saturday I was supposed to head along on a pub crawl that ended up falling through. Instead a few of the boys organised a more truncated route and whilst pondering said route I sampled Brewcult's One Fish. Two Fish. Red Fish. Brew Fish. at The Gertrude Hotel. For 3.8% this packed a heap of flavour with good caramel malt flavours as well as more than adequate hopping. Riding Steady (Level 10) is why you're reading about it. Later that very night, my first visit to the Commercial Club Hotel yielded Hotel Hopper (Level 7). Vale IPA was the beer of choice while we watched the last session of the cricket and bet on some particular dubious dog races... The beer is pretty solid, with hops and malt nicely balanced. There are some citrus, passionfruit and pine hop flavours, although it is lacking in bitterness. As far as non-craft venues go - having this on tap is a pretty good step in the right direction. I've written a little bit about Orbost's Sailors Grave Brewing in the last few weeks; their new one is a Whisky Sour Berliner Weisse which unlocked New Brew Thursday (Level 26). I was a little disappointed with the flavour of this one - the whisky was barely present and it was more like a woody sour, with just the faintest hint of citrus towards the back. Despite this sounded unappealing, it was nicely carbonated and quite refreshing. For once I was thrilled to see the Riding Steady badge! I don't think I would've spoken about MoonDog's Beer Can unless it had unlocked (Level 11) of the aforementioned badge. Firstly what a name! Secondly; it's actually a really good beer! It's an incredibly easy drinking lager, with nice tropical fruit and citrus notes. This beer is going to be a real winner with your non-craft drinking mates! Deschutes' Sagefight Imperial IPA unlocked a badge I wasn't expecting; it's own! Battle Royale was the name of that badge and was only available until December 1st, 2X (Level 9) was also unlocked by this check-in. This was billed as a battle between hops and botanicals, and in my opinion botanicals came out well on top. Juniper dominated the nose and palette, while there was also some some sage that made itself known. It still had that IIPA sweetness, but was lacking the hop bite. It's not a beer I'd be rushing back to, although I am pleased I got to try it. Just as I was saying that the Better Together badge was drying up, (Level 17) rolled around with perennial contributor Amager again at the forefront. Their collaboration with Cigar City, Game of Arms, is an "Imperial Licorice Porter". It certainly lived up to that tagline with plenty of licorice, possibly even too much, accompanying nicely roasted malts. I wouldn't rush back to it - however I will never not buy one of these Amager collaboration beers; they're consistently excellent! I love doing beer advent calendars and this year I have got the To Øl version; To Ølekalender. Their Kaffe og Røg was a Smoked Beer I haven't tried before and a great one to get in an advent calendar as I probably wouldn't have bought it myself. It unlocked Danish Delight (Level 9) and had subtle smokiness as well as some interesting herbal qualities. If things go to plan you'll hopefully be reading more about this beer later tonight! I was lucky enough to be selected from the Crafty Cabal cohort to attend a tasting session with the guys behind Old Wives Ales as part of their first birthday celebrations at Carwyn Cellars. One of the highlights from the day was their Red Sky at Night, a raspberry Saison which has been aged for 9 months in the keg. Whilst not being particularly pink, the beer packs a nice raspberry bite with reasonable tartness being imparted by some lactic acid. There's also some lovely pepperiness, which has come from the 3711 French Saison yeast that they utilized (there's a funny story about that, which I'll save for another day. Trip to the Farm (Level 19) was the badge. In addition to the Old Wives Ales first birthday celebrations; Carwyn are holding a month long BrewDog tap take over. Highlander (Level 6), the badge for drinking Scottish beers, was unlocked Chili Hammer - the chili infused version of Jack Hammer. This reminds me so much of Garage Project's Death from Above, with mango and peach being complimented by a reasonable, yet not overpowering, chili kick. Just before I was to leave Carwyn the Old Wives Ales guys managed to get their Pop's Passion Tart, a Berliner Weisse, keg pouring correctly. Boy was I glad they did! This was a wonderfully refreshing beer with plenty of tart passionfruit flavour. I really hope this gets bottled down the track, it'd be perfect for an afternoon by the pool. Pucker Up (Level 46) and Ich Bin Ein Berliner, the new badge for drinking Berliner Weisse's, is why you're hearing about it now. The second beer from the To Øl Ølekalender was their Sessions: Cloud 3 Wit, basically a lower ABV version of their Cloud 9 Wit. Clocking in at just 2.8%, this beer unlocked Riding Steady (Level 12). For what it is this a superb beer; it has a night wheat body, with orange peel, peach. lemon and some unidentified fruit complimenting it. The beer is slightly lighter bodied than a full strength witbier, but I may have only noticed that because I was looking for it. I can't understand the lack of love this beer receives for the life of me; it's great! Dubbel, Tripel and Quad Oh My! 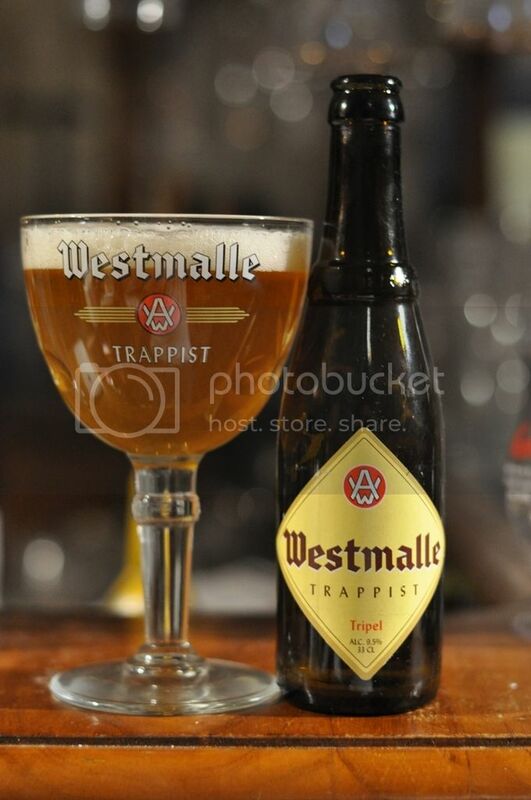 (Level 6) rolled around with a true classic; Westmalle's Tripel. I love this beer; yet still don't think I've written or said something succinct about it. It's lightly fruity and has light sweetness from the candi sugar, but the real winner is the peppery spiciness delivered by the yeast. This beer has previously been reviewed on Beer O'Clock Australia, which you can check out here. It's a beer that all beer lovers have to try at least once; it's the quintessential Tripel!